When it comes to smoking premium cigars, aficionados also want the best accessories to go along with their smoke. Brizard and Co. knows how to produce accessories that are both elegant and functional. Don’t let the beauty distract you. These products have ultimate functionality to preserve, cut and ignite your finest cigars while being eco-friendly. One of the challenges with many premium accessories is they are often comprised of exotic woods that contribute towards the depletion of our planet’s resources. Seeing an opportunity within this challenge, Cyril Brizard was inspired to create his unique line of accessories. 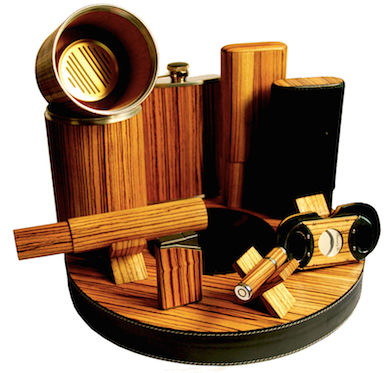 Brizard and Co. makes use of woods that provide the user an exceptional experience without having to utilize the endangered woods so popular in many cigar accessories. The Brizard and Co. name is synonymous with beautifully designed cigar components that take on a more ethical approach. In his relentless efforts to find premium materials that were high quality, Cyril Brizard decided to only purchase the raw materials used in his cigar lighters, cases, flasks, cutters, and ashtrays, from the Forest Stewardship Council (FSC). This organization is responsible for setting the standard when it comes to forest management. 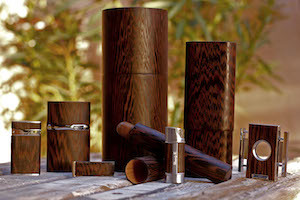 Working closely with the Forest Stewardship Council, the Brizard and Co cigar accessories name makes use of unique woods like Makassar Ebony, Carpathian Elm, Zebrawood, and Bubina. 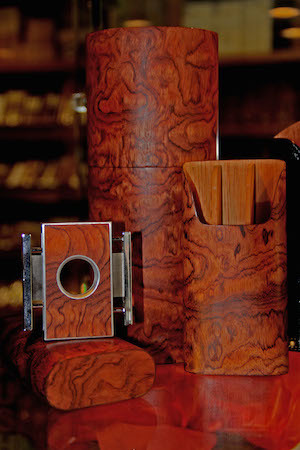 These woods are imported from all over the world, then cut directly into those cases, cutters, and lighters that make up the exquisite line of Brizard and Co. cigar accessories. Utilizing this type of process, the company has been a leader in the effort to decrease deforestation across the globe. Having established a significant source of high quality materials for the cigar accessories in this brand, one only needs take a close look at the attention to detail to see why the company enjoys worldwide recognition in this highly competitive industry. The craftsmanship that goes into every piece is unrivaled in an industry where so much attention is placed on premium looks and design. Take a close look at the wood inlays on a Brizard and Co. cigar case to see how the grains all align perfectly throughout the piece. These grains also give each piece that distinctive look of being a true one-of-a-kind accessory that cigar aficionados expect from all their products. During the production of all the Brizard and Co. cigar accessories, painstaking attention is put into making certain all the application seams are completely invisible to the view. 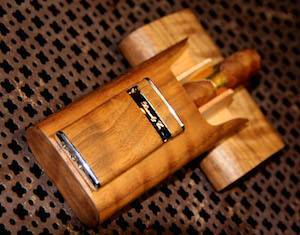 The unique interface between metal and wood on the Brizard and Co. cigar cutters and lighters appear at first glace to be a natural union of two unique materials. The woods that are used to create each piece almost appear to be sculpted right from the natural shape of the rough material. An effort is made to never apply heavy coatings of lacquer on the accessories so they have a more organic feel and touch to them. A very fine sanding and a teak oil application are used to bring out the natural wood grain in each piece. Cigar smokers in Edmonton can enjoy a large variety of cigar accessories as Nottingham Cigars and Pipes proudly carries the Brizard and Co. line of products. When you purchase on the Brizard and Co. cigar accessories, you are getting a premium made piece that is a unique blend of both luxury and ethics.